Words are important. The ones you choose to convey a message are essential to how you want the message to be received. I chose the word "retirement" in communicating about my departure from United Way six months from now for very specific reasons. Most importantly, it captures the tone of what I want the next phase of my life to feel like. I want it to be a time of following my instincts, listening to my whims, and having the flexibility to make choices in the moment. I'm turning 50 in the next few weeks. It feels like the perfect age to start something new and exciting. Time feels increasingly precious, and not just because I'm getting older. I need time to do my creative pursuits. I need time to safely deviate from commission work to do projects that feed my soul. Last week time was not in abundance. Every available minute was spoken for with projects that were due. This week is going to be largely absorbed by a conference trip. So, this morning I'm particularly appreciative of time. I like to breathe. When my calendar is too full, I find that I go for days on end without slowing down and appreciating what's around me. I like being able to stop, listen to the birds, smell the flowers, and breathe in the world. Breath is essential to life, but breathing deeply is essential to living well. 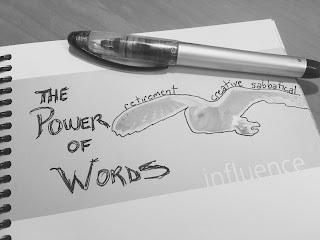 I used two very specific words to describe the year ahead: creative sabbatical. Creative aptly describes the kind of activities I want to be doing. Sabbatical describes the frame. Though we are self-funding the one-year exploration, I am approaching it in a similar way in which an academic might do research or writing for a year, away from the demands of a teaching schedule. Words, when chosen wisely, can have a tremendous impact on how others understand us, and how we understand ourselves.